Maharanas of Udaipur were indeed magnificent. Hereby we bring all about the Maharanas of Udaipur. 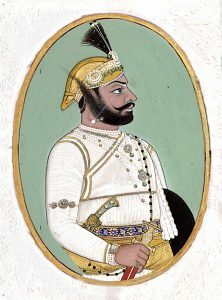 Maharana Bhim Singh Ji, Son of Maharana Ari Singh II, was the First Maharana of Udaipur and Twenty-Fifth Maharana of Mewar. He became King at a minor age of 10 years and during his minor years of age and even adulthood, he ruled under the inspection of his mother Rajmata Sardar Kunwar Jhali Ji. He inherited an unstable kingdom and it was the same during his reign. Marathas took off from the region, taking along all the riches and farmers too abandoned the region. Apparently, Maharana too was very broke to even get his sons married, which arguably were 32 in number. To deal with the financial mess, Maharana signed a treaty with Britishers which gave them full power over the kingdom. According to the treaty, a British agent will be appointed in the kingdom to see all the affairs with no interference of the King. It was a fortunate stroke of serendipity when Col. Tod was appointed as the British agent and during his time in Udaipur, kingdom experienced good returns on revenue. 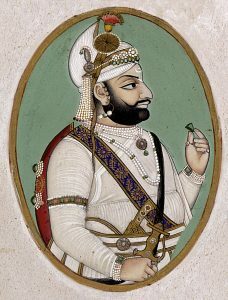 He believed that Maharana was rather slothful and least interested in ruling the kingdom effectively. 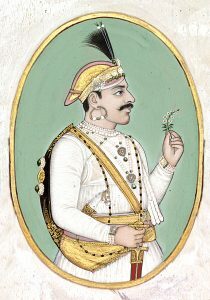 Maharana died at an age of sixty in 1828. Maharana Jawan Singh Ji, son of Maharana Bhim Singh Ji, inherited a bankrupted kingdom and ruled for a very short time span of 10 years. The treaty signed by Maharana Bhim Singh Ji turned out to be insignificant as it did not serve the purpose. Maharana Jawan Singh Ji too tried hard to lift kingdom financially but failed and kingdom did not prosper significantly. At a young age of 17, Maharana died with no designated Heir. 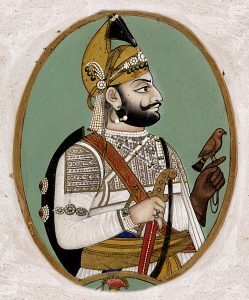 Due to the failure of the preceding king to choose an heir, Maharana Sardar Singh Ji, the successor of Maharana Sangram Singh Ji II, was chosen as the King. He then went on to rule Udaipur but he died only after 3 years of sitting on the throne and left behind obsolescent kingdom. Maharana Swaroop Singh Ji, younger brother of Maharana Sardar Singh Ji, was adopted and appointed the Heir as Maharana had no son. Swaroop Singh Ji inherited an unstable kingdom but brought about some reforms to get the state back on track. He introduced a new coinage, outlawed “Sati” tradition and brought some administrative reforms. He also gained the trust of Britishers by terminating rebellion in Nimbahera and Neemuch and providing the roof to British refugees. Kingdom started uplifting. 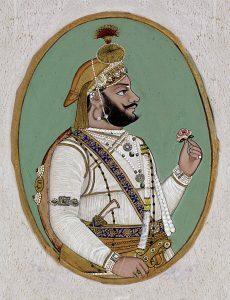 He died soon after adopting Shambhu Singh as his appointed heir. Maharana Shambhu Singh Ji, the successor of Maharana Sangram Singh Ji II, became a minor king of the comparatively progressive kingdom and when he attained full power, introduced various policies and reforms and the state blossomed. He got Military reassembled under his rule, formalized various policies to arrange administrative resources, institutionalized offices for temples and holy places and the first-ever school for girls was established in the state. 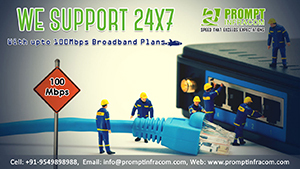 “Sati Pratha” was on the path of termination as a legal practice and fines were introduced for practitioners. Infrastructure saw a surge this time as roads and railway tracks were constructed. He died at an early age of 27 years, leaving behind no heir. Maharana Sajjan Singh Ji, the first cousin of Maharana Shambhu Singh Ji, inherited the kingdom after Shambhu Singh Ji’s death. Under his rule, true prosperity set its foot in the kingdom. Development of railway tracks, roads, and water supply took place, Schemes for afforestation, farming techniques, and irrigation were formalised, di-siltation of Lake Pichola was done post- floods in the region, the magnificent Sajjangarh Palace aka “monsoon palace” was built and Udaipur became the second city in India to have the Municipal Corporation after Bombay. Medical and educational institutions were developed, corruption was checked and guilty were executed. On the contrary, Maharana had a profound fondness for Art and Culture and he used to compose Dohas and Sawaiyas in Thumri, Folk, and Ghazal style. The book “Haqiqat Bahida” was the version of his daily journal. He had a short yet a remarkable reign period of a mere 10 years and these 10 years are written in Gold in the history of Udaipur. Maharana Fateh Singh Ji, the descendant of the fourth son of Maharana Sangram Singh Ji II, was adopted by Maharana Sajjan Singh Ji as his appointed heir. He shaped and brought to life all his vision during his reign. He worked towards the path of the betterment of kingdom by modernizing and improving roads, railways, settlements, medical and educational facilities. He built the Majestic Shiv Niwas Palace, which is now a luxury hotel. Fateh Sagar Lake too came into existence after the extension of Dewali Lake when Connaught dam was built. He was a true Suryavanshi King, who did not believe in the graciousness of the “the Queen”. 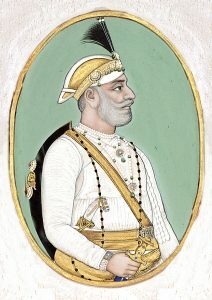 With an extraordinary life as “the Maharana”, he died at the age of 80 years. 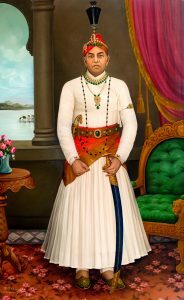 Maharana Bhopal Singh Ji, son of Maharana Fateh Singh Ji, became king when India was struggling for independence. He wholeheartedly supported the political and social modifications that were taking place in the country. He institutionalized schools and colleges in the kingdom, especially for girls and also took care of the natural beauty of Udaipur. He constructed Bhopal Singh Dam and several projects for afforestation in the Aravalli region. 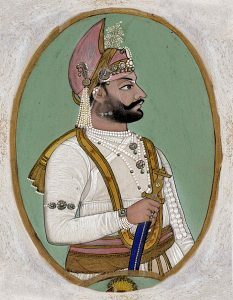 After independence, he merged the kingdom with the Rajasthan Union and was appointed as “Maharaj Pramukh” of it by Indian Government. Even though being physically inefficient, as he was paralyzed from the waist down, he was no less than any ruler in terms of greatness and courage. He adopted Bhagwat Singh as his appointed heir and died soon after. Maharana Bhagwat Singh Ji, the fourth son of Maharana Sangram Singh II, steered the kingdom according to the changing times as independent India was witnessing a number of transformations then. In 1970, Royal titles and grants were being abolished and Maharana became Mr. Bhagwat Singh Mewar. A true visionary who believed in the welfare, he decided to sell the royal forts and palaces in order to maintain them the way they were. Jag Niwas was converted into Lake Palace Hotel and other estates on the shore of Lake Pichola like Fateh Prakash and Jag Mandir too were sold off. He died in 1984 and thus was the last Maharana of Udaipur. With the intellect and initial efforts of our Kings, Udaipur is now amongst the most beautiful cities in the world where people live in harmony with each other. 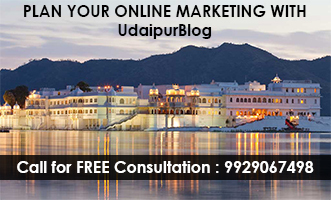 Culturally, traditionally, naturally and in every aspect, a city could be, Udaipur is perfect!